Revelle, the grandfather of modern global warming science, former Director of the Scripps Institution of Oceanography, and former science adviser to the U.S. Secretary of the Interior, was deeply trusted as an objective, careful and honorable scientist. He was worthy of that trust. 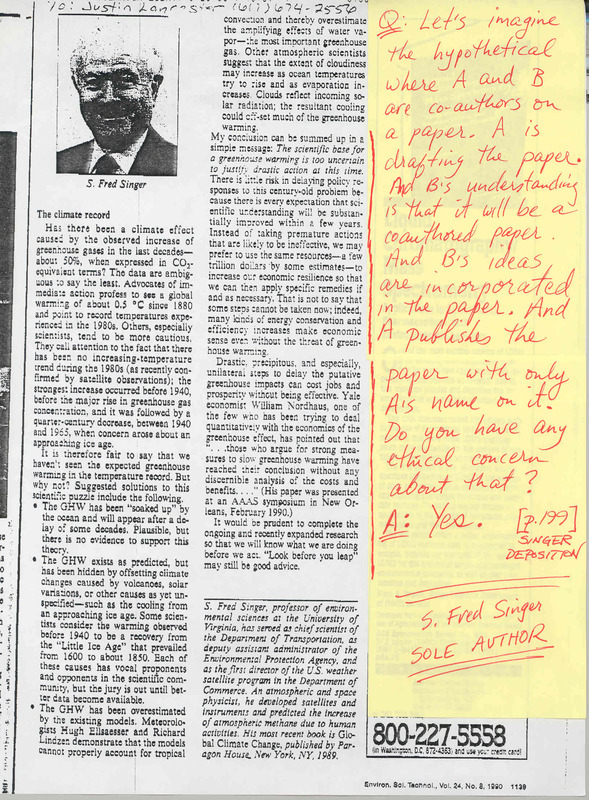 S. Fred Singer claimed sole authorship of the major statements of the article in his ES&T paper months before he put the finishing touches on his Cosmos Masterpiece. 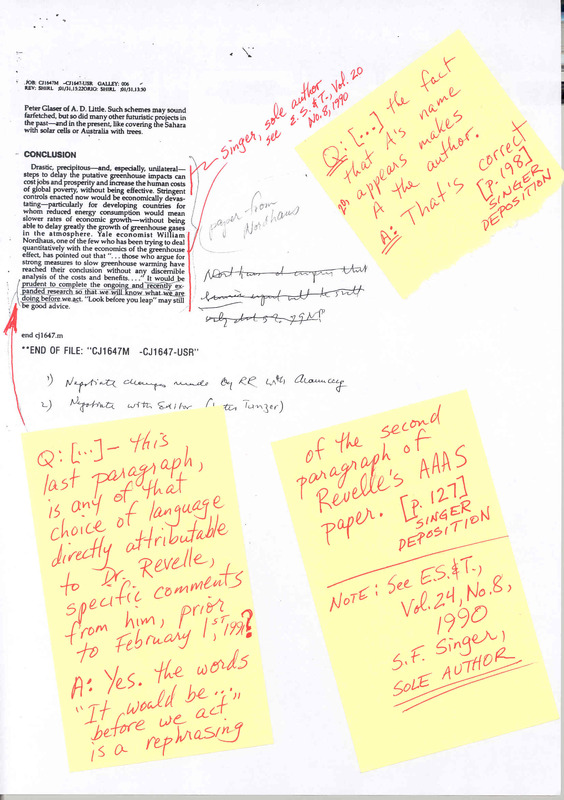 If S. Fred Singer is sole author of this material, then Revelle cannot be an author. If S. Fred Singer is not sole author of this material, then he has admitted in his deposition to ethical concern about one author publishing under his own sole authorship material that was co-authored. Over ten years ago, I was forced by a SLAPP suit to retract my statements exposing the Cosmos myth described here. Likely to prevail at trial because my statements were true, I regretted deeply that I could not then afford to continue. I had hoped, in settling, that the other side would honorably let the Cosmos paper and this issue slide into obscurity. This did not happen. 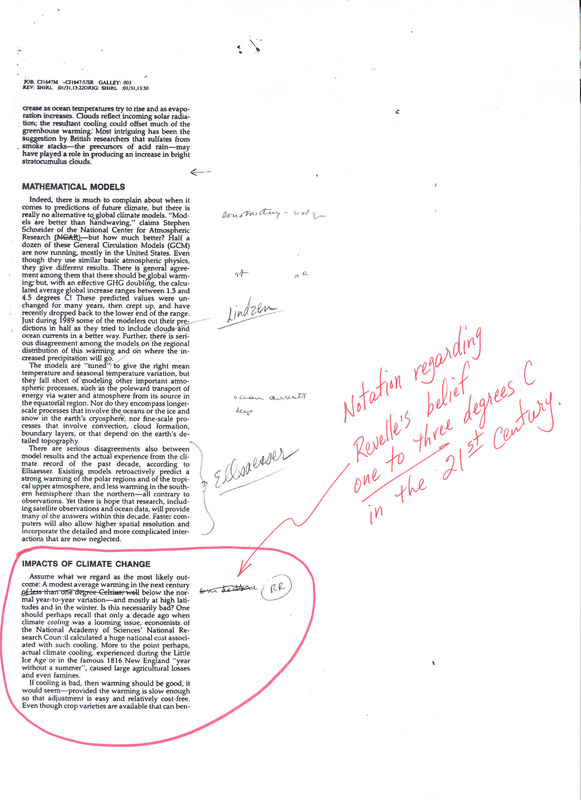 In 2003, Singer published a book chapter, titled The Revelle-Gore Story: Attempted Political Suppression of Science, that presented the story the way he'd like it to be known. His story vilifies both me and Al Gore. The editor of that book swallows the story and echoes the condemnations in his own introductory chapter. And the objectionable use of this Cosmos article by the very participants in its creation has not ceased (see Balling, SEPP, May 2006).